Encontrei 129 Hotéis em Colle Campo. Escolha a data de entrada e saída para ver os hotéis disponíveis em Colle Campo. Sem informar as datas, os preços com (*) são preços médios de cada hotel e nos arredores até uma distância de 10 km. Located in Macerino, this apartment features a seasonal outdoor pool. The unit is 44 km from Assisi. The kitchen is equipped with a fridge. There is a private bathroom with a bath or shower. Orvieto is 41 km from Apartment Macerino 1, while Viterbo is 50 km away. The nearest airport is Perugia San Francesco d'Assisi Airport, 48 km from the property. Historical residence "Arcus" is situated in a small village surrounded by the Umbriam countryside, in a very isolated position. The Castello di Macerino has origin dated back to 200 DC, one of the 4 former towers of the fortress nowadays does not have the shape of a tower anymore. It is located 8 km from the centre of Portaria, 14 km from the centre of Acquasparta, in a quiet position. There is a swimming pool (6 x 10 m, 01.06.-30.09. ), and table tennis for shared use. You can also play tennis for additional charges. The garden includes garden furniture. The following facilities are available in the complex: restaurant, bar, and washing machine (for shared use). You can access the house by motor (3 km via unmade road). The following facilities are available in the surrounding: grocers 50 m, and riding stables 25 km. Please note that a car essential. This apartment is suitable for disabled people. Located 44 km from Assisi, Fiore 3 offers pet-friendly accommodation in Macerino. The property is 40 km from Orvieto and free private parking is offered. There is a seating area, a dining area and a kitchenette equipped with a refrigerator. There is a private bathroom with a shower. Viterbo is 50 km from Fiore 3, while Spoleto is 12 km away. The nearest airport is Perugia San Francesco d'Assisi Airport, 47 km from Fiore 3. 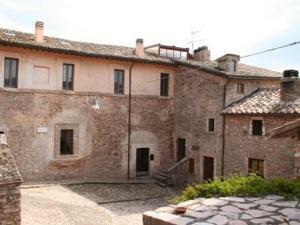 Fiore 4 offers pet-friendly accommodation in Macerino, 44 km from Assisi. The air-conditioned unit is 40 km from Orvieto. Free private parking is available on site. The kitchenette features a refrigerator and there is a private bathroom. Other facilities at Fiore 4 include an outdoor pool. Viterbo is 50 km from Fiore 4, while Spoleto is 12 km away. Perugia San Francesco d'Assisi Airport is 47 km from the property.